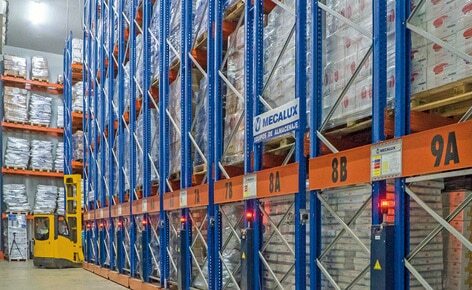 The warehouse installed by Mecalux, with capacity for more than 6,000 pallets, meets the high work volume that a company dedicated to the handling and storage of frozen goods like Bajofrío requires. The company, with more than 20 years of experience in the sector, has some new and innovative facilities located in an important transport hub in the coastal city of Valencia. The Bajofrío warehouse has 16 double Movirack mobile racks, which are approximately 11 m high and 29 m long, and six fixed racks. This system of mobile racking is ideal when you want to optimise the space available to achieve the greatest possible storage capacity and not block direct access to each pallet. The racks are placed on guided mobile bases that move sideways autonomously. Thus, the operator only has to open the aisle they need to work in when required. Removing and replacing the pallets is done via reach trucks. Similarly, and accommodating the needs of Bajofrío, the Movirack system is ideal for companies that use cold storage (frozen or refrigerated) because it achieves significant savings in energy consumption for cooling, distributing chilled air between a greater number of pallets stored in the racks. The Bajofrío’s logistics centre also features five raised docks to perform the loading and unloading of goods. An aisle that connects with the emergency exits was set up that coincides with the rear of the warehouse, in order to ensure maximum safety of operators. Increased storage capacity: the Bajofrío warehouse has a total storage capacity of 6,000 pallets to store a variety of products. Cost reductions: the Movirack mobile racks significantly reduce energy consumption for cooling, thus resulting in cost saving. Greater work safety: an aisle connects the rear of the warehouse with the emergency exits.